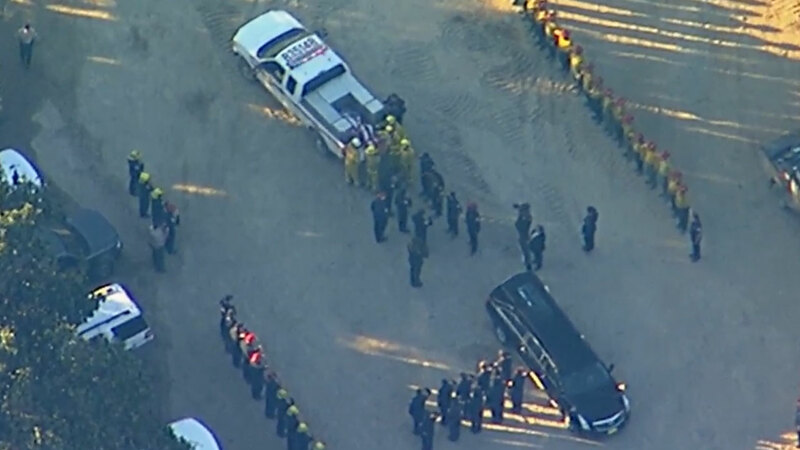 A procession honored San Diego Cal Fire firefighter Cory Iverson, who was killed battling the Thomas Fire near Fillmore Thursday. VENTURA, Calif. -- A firefighter from San Diego was killed while battling the Thomas Fire, Cal Fire officials said on Thursday. The firefighter was identified as Cal Fire San Diego Unit Fire Apparatus Engineer Cory Iverson, according to Cal Fire Director Chief Ken Pimlott. Dozens of fellow firefighters lined up in Fillmore to honor Iverson in a procession. I am very saddened to report that a firefighter fatality has occurred on the Thomas Incident. The incident is still unfolding, but in this world of fast moving information, it is important to me that only factual information be shared. To that end, I can confirm a fatality of a CAL FIRE Engineer from the San Diego Unit has occurred. IMT 4, CAL FIRE Local 2881 and Southern Region leadership are working to support the Unit and his family, who have been notified. More details will be made available as they are confirmed. In the meantime, please join me in keeping our fallen firefighter and his loved ones in your prayers all the responders on the front lines in your thoughts as they continue to work under extremely challenging conditions. As the massive Thomas Fire continues to grow, the destructive blaze is now considered the fourth largest wildfire in California history. Ventura County sheriff's officials said the firefighter suffered fatal injuries near the eastern flank of the fire sometime between 9 a.m. and 10 a.m. Thursday. The department's major crimes division is investigating the death. According to Cal Fire, the Thomas Fire has scorched 242,500 acres since it broke out Dec. 4, which amounts to 379 square miles. It is now the fourth largest wildfire in California history. The colossal blaze, which straddles coastal Ventura and Santa Barbara counties, was 30 percent contained as of Thursday morning. Click here for more stories on the Thomas Fire.